* Be aware of and avoid harmful noise. You can be exposed to harmful noise at work, at home, and in many other settings. This exposure builds up over time and can result in ear damage and hearing loss. Harmful noise can come from commonly used tools such as power lawn mowers and snow blowers or from activities such as riding motorcycles and snowmobiles. Know what kinds of situations can generate harmful noise levels, and avoid these situations whenever possible. * Use hearing protectors. If you know you are going to be around harmful noise, wear hearing protection, such as earplugs or earmuffs. Cotton balls or tissues stuffed in the ears do not offer any protection. When used correctly, hearing protection can go a long way in reducing the level of sound that reaches the ear. Lawn mowers, power tools, and some basic household appliances can damage your hearing if you do not wear hearing protection. * Control the volume when you can. Don't buy noisy toys, appliances, or tools when there are quieter alternatives. Reduce the noise in your life by turning down the volume on the stereo, television, or car radio, and especially on personal listening devices with earphones. 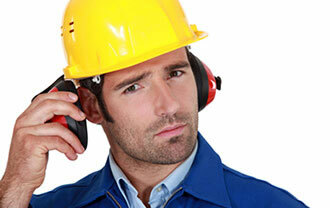 One-third of hearing loss is preventable with proper ear protection such as muffs, ear plugs or custom ear protection. At Rocky Mountain Audiology we provide state of the art ear protection for all activities such as motorcyles, music, swimming or sleeping. We will help make custom fit protection to suit your lifestyle. Available in different design, colors and styles – for all environments we have your hearing covered.